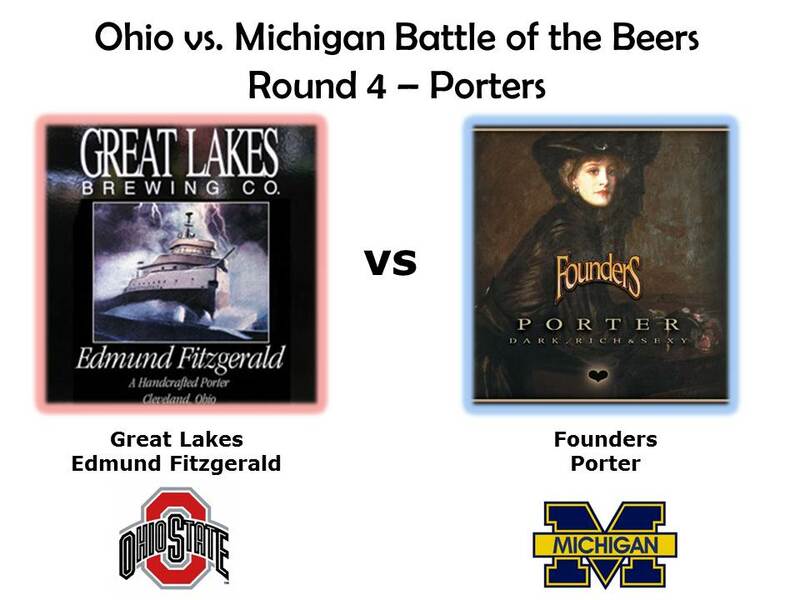 Round four features a titanic matchup between two great beers: Founder’s Porter and what some consider the quintessential Ohio beer, Edmund Fitzgerald Porter by Great Lakes Brewing. Edmund Fitzgerald by Great Lakes (Cleveland, OH) – For people in the Midwest Great Lakes Brewing doesn’t need an introduction. According to the Brewers Association it is the 13th largest craft brewery in the country (the only Ohio Brewery in the top 50). If you doubt my assertion that Edmund Fitzgerald is a strong contender for the flagship beer of Ohio, check out Tom Aguero’s (from the Queen City Drinks blog) post for the 6-pack project. In this interesting series, beer bloggers are asked to pick 6 beers that best represent their state, and Tom uses his #1 pick to highlight Edmund Fitzgerald. Mr. Fitzgerald tips the scales at 5.8% abv. Porter by Founder’s (Grand Rapids, MI) – This is the second straight round where Michigan is represented by a Founders beer. What can I say, Founders makes excellent beers across their entire lineup. I think one can make a strong argument that they are the best brewery in Michigan. I’ve just showered a lot of praise on Edmund Fitzgerald Porter, but don’t let that fool you into thinking that this is a David vs. Goliath mismatch. Founders Porter is rated as the #3 porter in the world by RateBeer.com (Eddie Fitz is #7) and on BeerAdvocate.com Founders Porter has a score of 4.26 (out of 5) vs. Edmund Fitzgerald’s 4.27. Despite the impressive pedigree of Founder’s porter this will be the first time I’ve tried it. Founders Porter checks in at a slightly higher 6.5% abv. Edmund Fitzgerald has a deep dark brown color, but if you hold it up to the light a few ruby colored photons make it through. Dark roasted chocolate malts dominate both the smell and the taste of this beer, although if you search for other flavors long enough there is a hint of cola and coffee in the background. There is a lingering bitterness on the finish. The flavor description on the Great Lakes website is pretty accurate—Bittersweet chocolate-coffee taste and bold hop presence. I would add the qualifier that the hops (Northern Brewer, Willamette and Cascade) only make their presence known at the finish. Founder’s Porter is a similar beer in many ways. It’s only when you drink these beers back to back that you can readily differentiate them, so I’m going to focus on the differences rather than the similarities. To the eye they are similar in color but even when you hold the Founders Porter up to the light it’s still completely dark, while EF lets a little light through. The head on the Founders Porter is also a little darker, more of a mocha than the light beige of EF. The Founders Porter is a beer that tastes exactly like it smells. Compared to EF the chocolate is even more dominant, the mouthfeel a little creamier, and the finish a little smoother. While Edmund Fitzgerald leaves you with lingering bitterness, Founders Porter leaves you with a smooth chocolate aftertaste. Both are world class Porters, so this was a hard choice. For the blind taste testing at the party I picked the Founders Porter, which surprised me because I’m a big time Edmund Fitzgerald advocate. So I did a blind taste test four days later with a full bottle of each beer and once again I chose the Founders Porter. The smooth chocolate taste of it is just so irresistible. However, I will say that the more aggressive hop presence in Edmund Fitzgerald makes it a more complex beer, while the Founders Porter is more of a one trick (chocolate) pony, but it does that trick extremely well. After finishing both pints I was starting to tire just a bit of the Founders Porter. If I had to drink 3-4 in a row I would probably choose the Edmund Fitzgerald. My advice is that if you like bitterness and complexity in your beers go with Eddie, but if you are more of a chocoholic go with the Founders. On a 1-10 scale I give Edmund Fitzgerald a 7.5 and Founders Porter an 8. See the video below for the people’s pick. Unlike most other rounds in the competition these two beers were almost universally liked. There were a lot of 7s and 8s on the score sheets at the end of the night. In the video my friend Ted and I start with some thoughts on Gordon Lightfoot and then compare and contrast the charms of Edmund Fitzgerald and Founders Porter. Unlike some of the other videos our analysis is pretty spot on with my review above. I came across this recipe for Founders chocolate cupcakes on the Founders website. I haven’t tried them yet, but I bet they are delicious. Nice recovery after insulting your viewers! My ability to say sensible things went steadily downhill the more beers we tasted.